Google’s third-gen Pixels might be the most leaked phones ever. From numerous Russian tech sites getting their hands on production-ready devices to stores in Hong Kong selling handsets a week ahead of the official announcement, there’s a lot info about the new Pixels floating around. But one thing all of the leaks couldn’t reveal were all the fancy software tricks that make the Pixels the finest Android phones around. Now we finally know the whole story. That standard Pixel 3 will feature a 5.5-inch screen, while the larger Pixel 3 XL will sport a 6.3-inch display. As suggested by the leaks, the Pixel 3 XL looks to maximize screen real estate with an edge-to-edge screen and a rather large notch on top, while the standard Pixel 3 offers a more traditional aesthetic with slim bezels on top and bottom. Thankfully, both phones feature the same flexible OLED touchscreen, so there shouldn’t be any major differences in colors between the devices like we saw last year on the Pixel 2. Elsewhere, Google says the Pixel 3's speakers should be about 40 percent louder than before and have been tuned with a special sound profile created by a Grammy-winning music producer. And to best show that off, Google will be giving new Pixel 3 owners six months of YouTube Music for free. Ok, so the new screen and speakers are nice, but since the beginning, Pixel phones’ most important feature has been its camera. But that doesn’t mean Google is hopping on the trend of adding tons of extra sensors to the back of its phones. Instead, Google is enhancing the camera software inside the phone to help you do things like take brighter, sharper, and more detailed photos even in challenging situations. Choosing your Top Shot in action. On the Pixel 3, Google has created a custom imaging chip called the Pixel Visual Core and built it right into the phone, so you never have to worry about needing access to the cloud to make pics look their best. On top of that, there’s also a bunch of new photo modes like Top Shot, which automatically selects what it thinks is the best shot out of the bunch. And if you don’t like the photo the phone suggests, you can scroll through other images and select your favorite. Here’s a Google-provided comparison of Night Sight and a low-light image from an iPhone XS. Meanwhile, in lieu of adding a telephoto camera to the back of the Pixel 3, Google has created a new feature called Super Res Zoom that takes minutely different photos and then combines them in software to create a single, high-resolution pic. But the new photo features don’t stop there, because Google says the Pixel 3's Night Sight tool will let users create stunning low-light images without even using the phone’s flash. And for all the older Pixel phone owners out there, Night Sight is going to be available as an update later this year. In front, Google has upped the number of cams from one to two thanks to the addition of a new wide-angle camera so you can take group selfies with ease. Google claims the Pixel 3's front-facing camera offers a 184 percent larger field of view than an iPhone XS. And for a little bit of fun, Google is taking AR stickers and turning them into a whole new mode called Playground so you can add graphics and effects to pictures taken with both the front and rear cams. Google Lens is also getting an upgrade so that it will now work in real-time, which means you don’t need to snap a picture first if you want to identify a specific pair of shoes or sunglasses. There’s also Photo Booth Mode, Motion Auto Focus, and an even better Portrait Mode. To make Google’s new phones easier to live with, the Pixel 3 is also the first phone to get new features that can screen and block calls from scammers, along with a new gesture called “Flip to Shush” that will automatically put the phone in silent mode when its lying face down. And to protect all your info, the Pixel 3 also includes a Google Titan security chip to help cut down on any potential viruses or malware. So What Is the Pixel 3 Like for Real? After getting a chance to test out the new Pixel 3s in person, it feels like I’ve walked into an interesting dichotomy. On one hand, the Pixel 3's specs are relatively mundane. As you’d expect from a flagship Android device, you get a Qualcomm Snapdragon 845 chipset and your choice of 64GB or 128GB of storage. But the Pixel 3's 4GB of RAM and lack of microSD expandability seems a little skimpy for a $800 phone. The standard Pixel 3's battery also feels undersized at just 2,915 mAh. Not pink or pink, you decide. The new texture glass back feels nice though. However, Google has improved the overall usage of the handset with Qi-based wireless charging (which is a first for a Pixel), while retaining IP68 water-resistance and improving the dual front-facing speakers to be what one Google rep called “loudest speakers” on any mainstream handset. But the most interesting thing about the Pixel 3's design is its new glass back. It still has that same two-tone look seen on previous Pixels, except this time its one continuous panel, which should improve strength and rigidity. On top of that, the texture of the glass switches a third of the way down the phone to something that feels like the soft-touch finish you get on ThinkPads and other laptops. But according to Google Pixel product manager Peter Prunuske, the texture isn’t just a coating that might rub off two or three months down the road, it’s actually a new special etching technique that results in a more grippy, less drop-prone feel. The biggest changes for the Pixel 3, however, are its software upgrades. Throughout the phone, Google has tailored the Pixel’s Android experience to be a smarter, more accommodating affair. 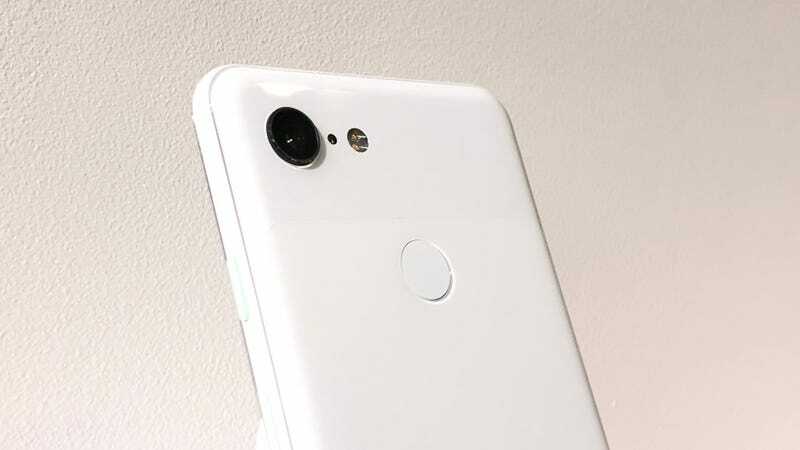 That’s most obvious when it comes to the camera, because while the Pixel 3's rear camera resolution has stayed pat at 12-MP, it’s also the only flagship phone this year to feature just one camera on its back, even in its jumbo version. If Top Shot sees something wrong, you’ll get a little popup down bottom suggesting something better. For its new Top Shot feature, Google has taken nods from high-end Olympus cameras by letting the phone capture images both before and after the shutter is pressed. From there, the phone can tell if someone was blinking or if a random object got in the way, which will prompt the phone to recommend a different frame that doesn’t have those issues. The Pixel 3's integration with the new Pixel Stand wireless charger is also surprisingly deep. Not only can you set your phone to automatically turn on Do-not-disturb mode when placed on the charger, by leveraging the Google Assistant, the Pixel Stand turns a Pixel 3 into a mini Home Hub of sorts. When paired, the Pixel 3 can show the live view from a Nest security camera anytime something triggers the motion sensor. Or you can use the Pixel 3 as a planning tool or smart speaker so you can see things like appointments or album art at a glance while you’re getting ready in the morning. While I want to test the two together more, the Pixel Stand seems like its going to be a mandatory add-on for anyone who buys a Pixel 3. The Pixel 3 is available for pre-order today starting at $800 for the standard Pixel 3, or $900 for the Pixel 3 XL. Shipments for pre-orders are expected to go out starting October 18th.